On the heels of our Emmy and Telly award-winning program, Journeys for Good: Cambodia, we have an opportunity to profile another humanitarian service trip which benefits impoverished families in Guatemala. Guatemala is a country with tremendous need. Literacy rates are among some of the lowest in the world and poverty is prominent. Low standards of living, poor sanitation, and even limited access to clean water are all daily challenges faced by many Guatemalans. Volunteers on this service trip will experience deep cultural immersion as they work alongside locals on projects chosen to address their needs. One chronic problem is that children, crawling on dirt floors, are often infected with parasites. Our group will be installing cement floors in the shelter homes of single moms. The concrete enables them to bleach the floors to sanitize them, reducing parasites and disease among the young children. Through original content for broadcast and the web, Journeys for Good: Guatemala will profile this service project to bring awareness to the social and economic challenges that impoverished Guatemalans continue to face. Even though Bayside Entertainment is donating all of the production and editing equipment (plus covering all of our out of pocket costs like music licensing, closed-captioning and motion graphics) and our non-profit partner Globe Aware is donating the ground costs so that we can cover this important story, we still need to raise $8,000 to get our crew and equipment to Guatemala. Please click below to make a contribution. See your name on the screen! Let us know the name you’d like to see listed in the show broadcast credits — for now and evermore! You can still help us by sharing this information with your social networks and connecting with us on Facebook. 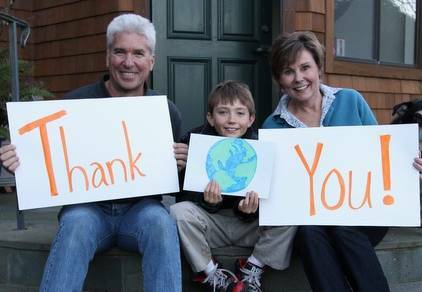 Thank you for supporting Journeys for Good!